Posted in Happenings on February 27, 2016 by Gordy Harrower . 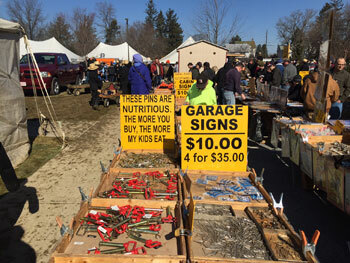 The 2016 mud sale season officially got underway this morning in Strasburg, PA as the Strasburg Volunteer Fire Company hosted their Spring Sale. 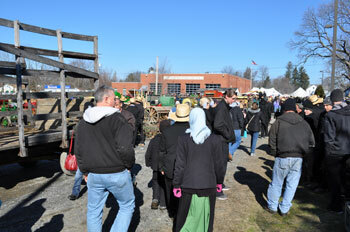 Auctions began at 8:30 this morning. It was a beautiful morning for a mud sale. While the temperature was still brisk, there wasn’t a cloud in the sky and the sun made it feel warmer than it was. I drove into Strasburg along the Strasburg Pike to avoid traffic, and found a convenient parking space just before Main Street in Strasburg, just two blocks from the auction site on Franklin Street. As I got out of my car (many others drove horse and buggies) I could hear the amplified voices of two or three different auctioneers echoing in the distance. And I could smell the aroma of chicken being barbecued over a grill. A short walk brought me to the auction site. 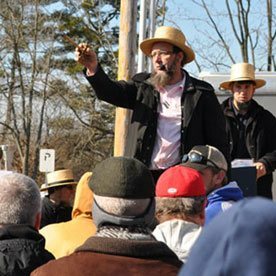 As I strolled around the grounds and peeked in the various tents I counted 10 different auctions going on simultaneously, each with crowds gathered around the mostly Amish auctioneers. 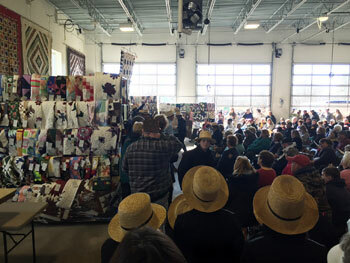 In between all the crowds of people and the many auctions were food sales – tables and trailers selling cheese, pretzels, homemade ice cream, french fries, and candy. Inside you could buy quarts of chicken corn soup and chicken pot pie, homemade baked goods, and freshly barbecued chicken, pork sandwiches, hot dogs, and more. I saw lots of people and lots of activity everywhere I looked. There was almost a carnival-like atmosphere here. If you are reading this today (February 27th) there’s still time to make it if you’re local. But if not, take heart. 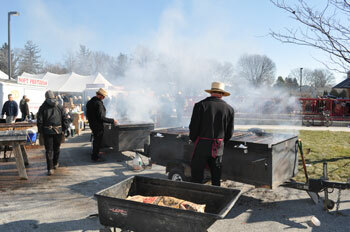 This is only the first of many mud sales taking place across Lancaster County this year. You can see the full schedule of mud sales here, along with links to map showing the locations of each sale. 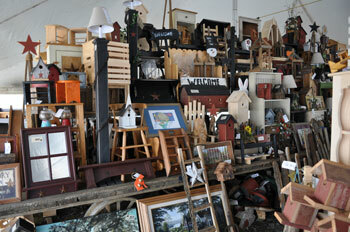 You can read a previous year’s post and watch video about the Strasburg Spring Sale here.